Hoists: CERTEX offers a full line of lever hoists, chain falls, and air and electric hoists from some of the worlds most respected manufactures. These products are useful for a variety of different hoisting, pulling, and lifting tasks. Cargo Control Products: The cargo tie down products you’ll find at CERTEX, USA are designed and manufactured according to the latest government standards. 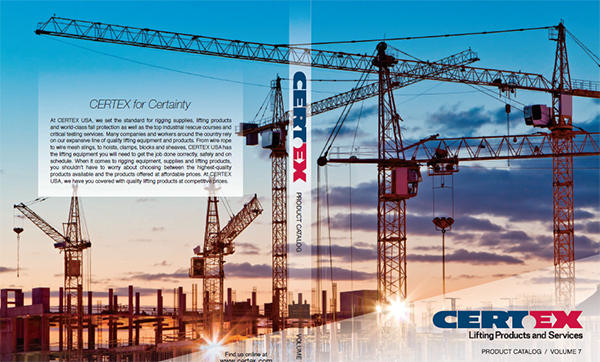 Wire Rope: You’ll find a variety of wire rope constructions and capacities at CERTEX, USA. From small diameter GAC wire ropes to large high performance ropes, you will discover that there isn’t just one type of wire rope that’s perfect for every job. At CERTEX, we can help you choose which type of wire rope will be the best option for the task. Wire Rope Accessories: We offer a wide variety of locking hooks, eye hooks, swivel hooks, sliding choker hooks, sliding latch type choker hooks, snap hooks, swivels, wire rope thimbles, and turnbuckles and other wire rope accessories.